Our scarifiers are an easy answer to achieving the flawless lawn. 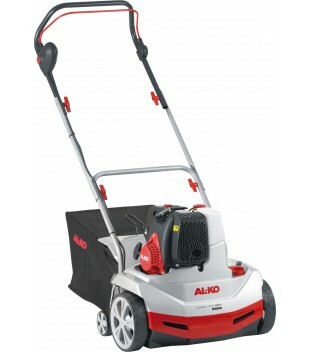 We usually either have the Hayter scarifier or the AL-KO 38 P Petrol Lawn Rake / Scarifier Combi Care Comfort in stock. The machines have either spikes or prongs which are used for breaking up matted vegetation in the surface of a lawn. The scarifier will allow you to de-thatch and help uphold a healthy, lush garden. Seasonally we have a log splitter in stock. 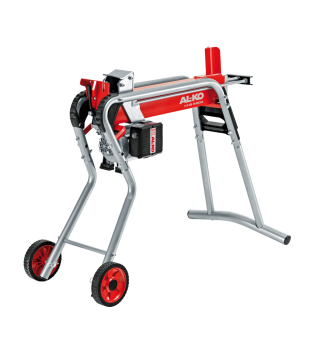 Our AL-KO KHS 5204 Electric Log Splitter is on a stand so there is no bending down to split your logs. It has a 5-ton splitting force so can tackle most logs up to 52cm in length. The two-handed safety operation ensures that the log splitter is safe to use as hands are kept away from the log being split. Using this machine is far easier than using traditional methods such as using an axe. * The scarification check – Pull a small metal cultivator through your lawn: If you see moss or dead grass residues, then it will be time for scarification – If weeds grow on your lawn, it is a clear sign that your lawn requires attention. * How a scarifier works – Our scarifiers are equipped with a rotating rollers with steel blades, which penetrate the ground briefly with each turn. * Height adjustment – Adjust the correct height when scarifying, two to three millimetres of penetration depth should not be exceeded. The collecting container is also important for the collection of moss and thatch. * Ground texture – The so-called “lawn thatch” grows best on loamy soil, shaded lawns or surfaces, which tend to stagnate. These areas should be more frequently raked and scarified. * Correct timing for scarifying – The best time to scarify is in spring (April) and autumn (September). After the scarification, the lawn should have time to regenerate. It is advised to mow the lawn before scarifying. Almost every garden owner dreams of a beautiful, lush green lawn. But why do some gardens seem like a desiccated desert and the lawn of the neighbouring garden appears in the most beautiful green every year? Maybe it is because the neighbour regularly scarifies and airs their lawn. Two processes that are indispensable for a radiant lawn. Ventilation is necessary so that the lawn can absorb enough nutrients and get enough air to breathe again. Simply explained, scarifying is intensive airing where the lawn surface is slightly cut. As a result, the soil is loosened, and the grass roots can regenerate effectively. Gardeners usually scarify their lawns in spring to refresh them after the cold season. Scarifying should also be done in the Autumn, especially if the previous winter was particularly hard. So, the lawn gets the necessary nutrients again to survive the next winter well. What exactly does scarification mean? A scarifier has a rotating cartridge with graded steel blades. These penetrate into the turf and thereby remove lawn thatch, moss and weed remains. This can be compared to a fixed, close-toothed rake, which penetrates a little way into the ground and, on pulling out, lawn thatch is removed. Scarifying manually using a rake is an option in smaller gardens, but when it comes to working in larger gardens, or lawns with a lot of thatch and moss, using a motorised scarifier is highly recommended. No matter what type of device is used, it is important to remove any dead plant parts, as they prevent the light and air from the reaching grass and roots. It should be noted that only dry, freshly cut lawns should be scarified. After treatments, the grass should be heavily watered and fertilised. A fertiliser has its greatest effect after scarifying, as the nutrients can easily be absorbed and processed. A new lawn seed could be applied for a thicker lawn. Conclusion: no gardener should miss scarifying. Once or twice a year, a lawn needs some care, so that it appears full of health and grows efficiently.